The Cloche originates from the 1920s and was made of felt for a form-fitting bell-shaped hat. 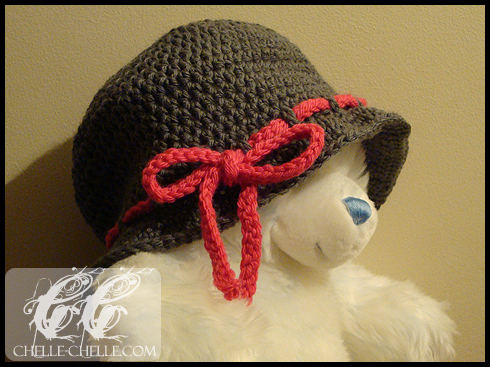 While I was looking for a new hat pattern to try out, I couldn’t find one for a cloche that I particularly liked. 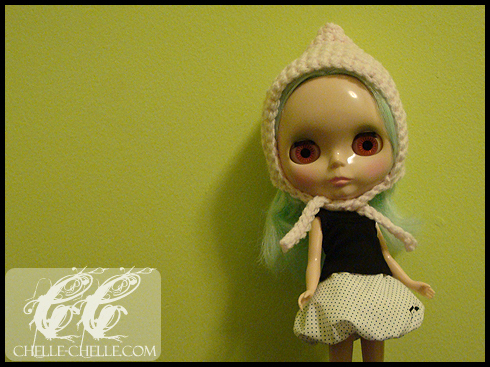 They were either too bell-shaped or not bell-shaped enough, so I decided to try my hand at making a cloche-inspired hat with just a subtle bell-shape that I wouldn’t mind wearing. I tried out, for the first time, Nashua Handknits Creative Focus Superwash (50% merino, 50% wool). 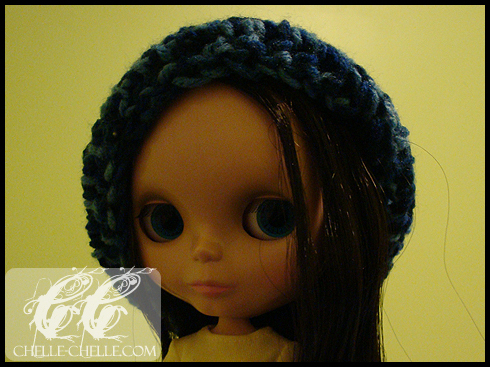 The yarn felt a little stiff when it was in the ball, but once it was crocheted up into the hat, it felt nice and soft. My only complaint about the yarn is that it splits easily when crocheting – this is a common issue with superwash yarns. 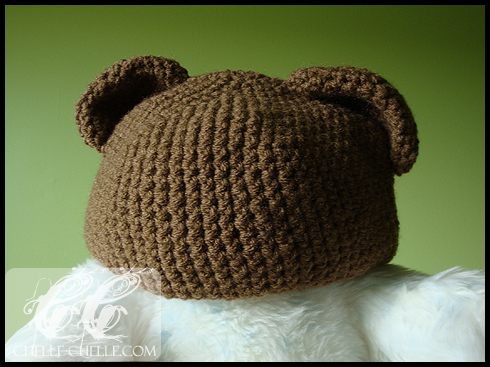 The pattern for this hat has been written up and has three different sizes available (21.25″, 22″ and 24″ for head circumference). 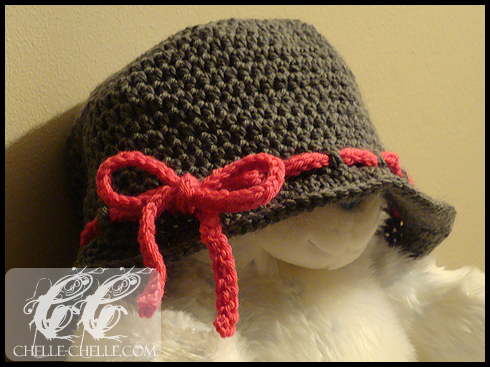 The name of the pattern is Ruse, there’s no real story about where the name of the hat came from. Want to make your own hat? The pattern is free! 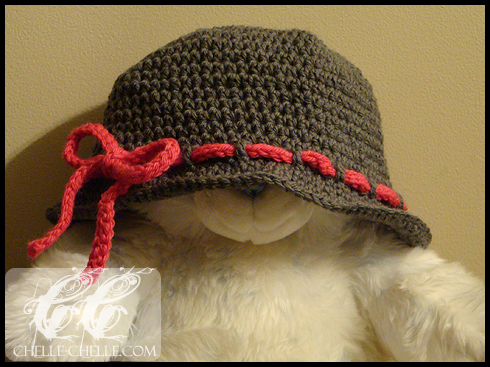 Click to download a PDF copy of the Ruse hat pattern. Update August 21 2010: Due to some questions regarding how to proceed with Round 1 of the Ruse hat pattern, I’ve updated the pdf file with the second revision and it is now available for download. 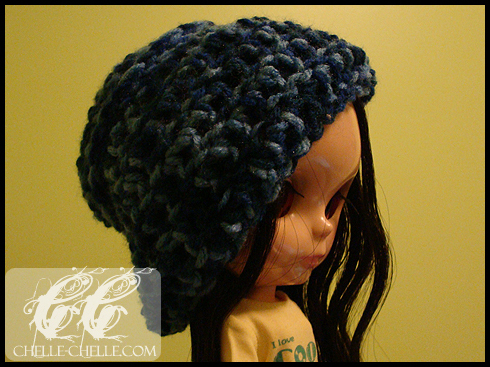 This hat was done in 100% acrylic yarn (Red Heart Comfort Prints). I finished the large ball that I had bought when I first started learning how to crochet, back in 2006. The ball was 340g (12oz) and I had used the majority of it to make a book bag (my first crochet project, done without a pattern) and other small amounts to make mini-purses (so I could practice how to increase and decrease). I pretty much threw all the simple stitches that I knew at this hat. There are single crochet, half-doubles, one row of triples, and a bunch of double crochets until the very end. There is also one row of back-loop only in single crochet and one row of front-post only in double crochet stitches. For this hat, I used Patons Astra 100% acrylic in ‘Baby Pink’. It’s super soft and I have no clue where I got this yarn from. I did make some changes from the original pattern, but the general idea and construction is the same. I didn’t really understand the part regarding making the strap so I just winged it until it looked about right. October, for those who are not aware, is Breast Cancer Awareness Month. Most people do know someone who’s life has been touched by cancer. And for those aren’t aware, I’m kind infatuated with Blythe dolls. 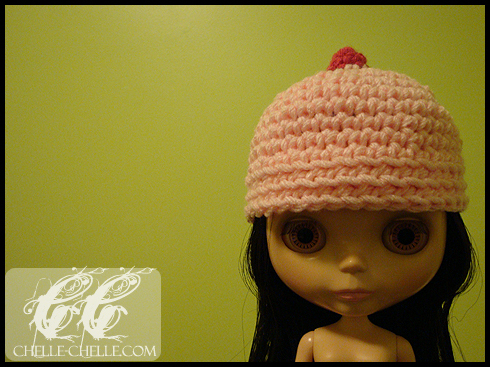 So, after seeing a fellow Blythe enthusiast’s photo of a knitted Breast Cancer Awareness hat on a Blythe doll on Flickr, I asked if I could do something like it in crochet (since my knitting skills aren’t up to snuff), so many thanks to battywing on Flickr for the inspiration! Materials: 100% acrylic yarn in light and dark pink. The Birthday bear hat was made for my friend’s birthday present. It’s crocheted in brown acrylic yarn for ease of washing (I avoid using 100% natural fibre yarns for gifts, especially since I know most people will toss things into the washing machines and I want to avoid things shrinking down several sizes). I made up the pattern myself. The ears are double layered to help with keeping their shape. They look a little wonky in the photos (the ear on the right looks a little lopsided). This is because my model’s head is not the same shape as a human head, so it doesn’t fill out the hat perfectly – but they’re both non-wonky and stay perfectly (… when on a person’s head).